' Geometric Wood Sliced Scandinavian Christmas Ornaments - Sisters, What! 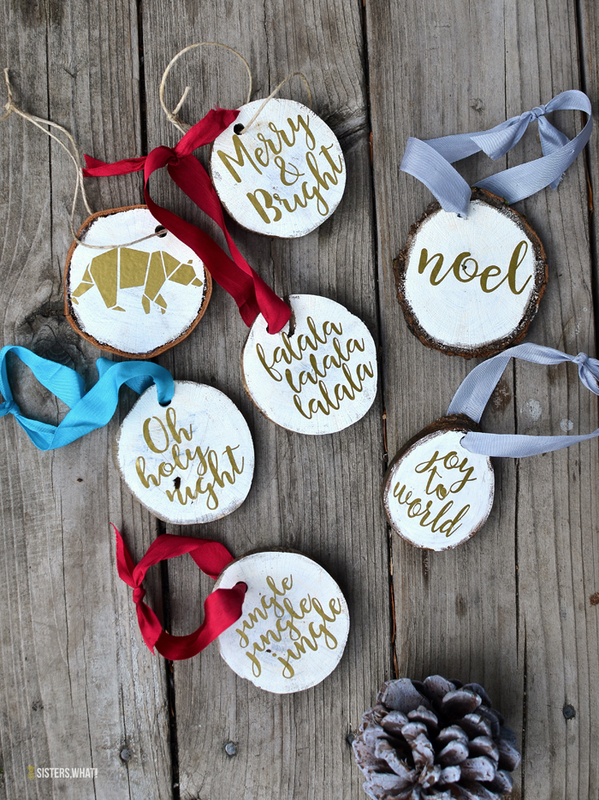 Woodsliced ornaments are really fun and easy to customize in so many ways! 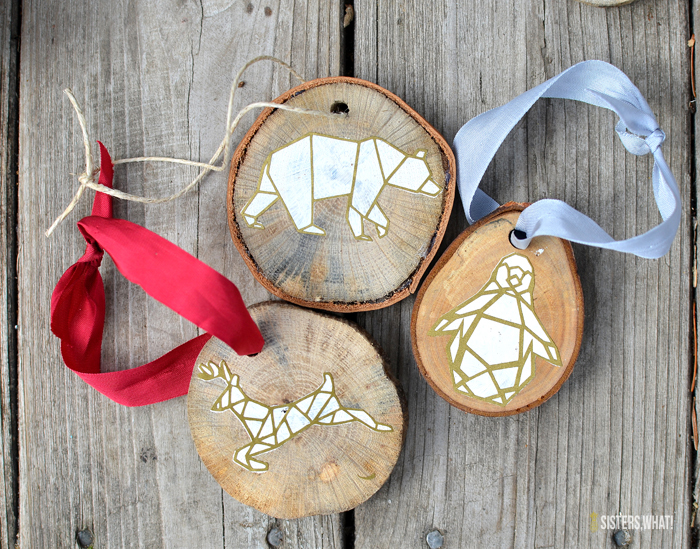 These geometric ornaments were surprisingly quick to make and I love the pop of gold. Thanks to Expression Vinyl for supplying the vinyl. This post may contain affiliate links; thanks for supporting Sisters, What! One thing I can't help myself (much to my husbands chagrin ; ) ) is making Christmas ornaments every year. He always says we have enough, but these past few years it has become a tradition that I just can't break. 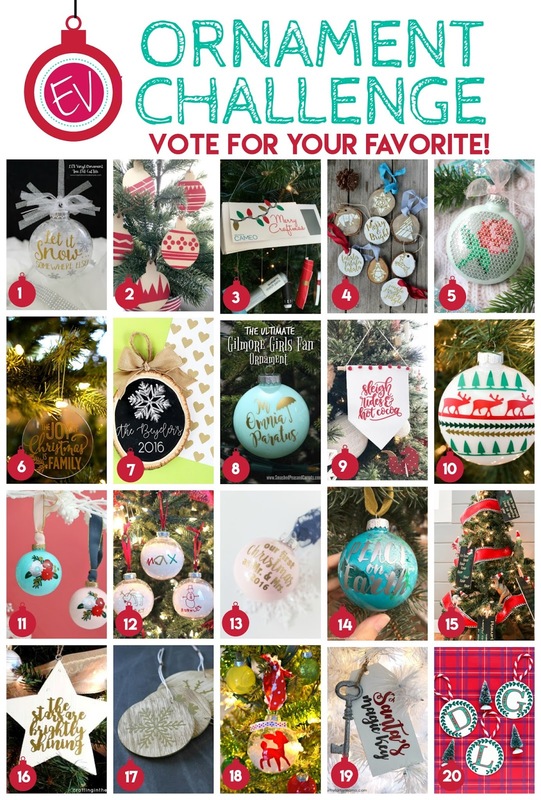 I feel that because Christmas ornaments are small, it makes it an easy Christmas craft and to me the tree is the most important Christmas decoration. 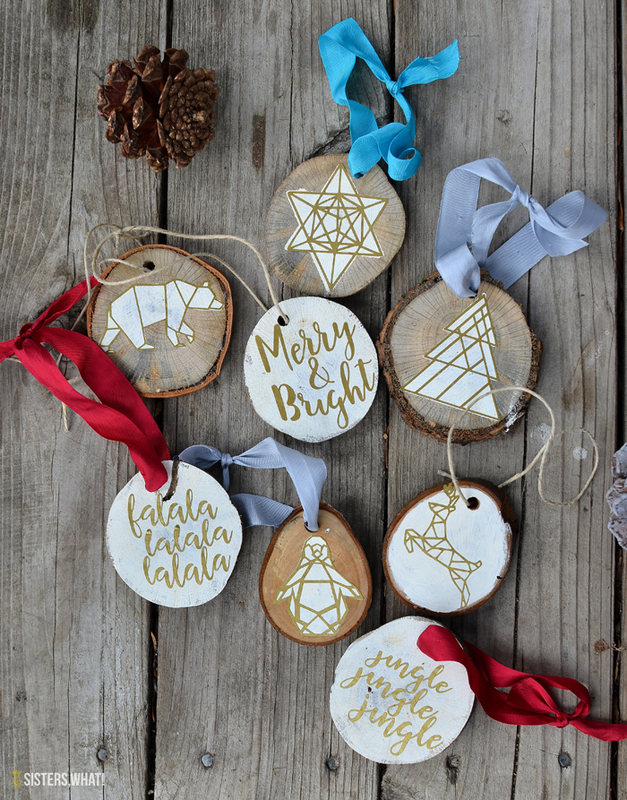 So when I was invited by Expression Vinyl to be part of their Ornament Challenge, I was so excited to get my ornament craft on. I had this idea of doing a simple scandinavian type of ornament and came across some gold himmeli and suddenly thought how fun would those be on an ornament but with animals as well!! 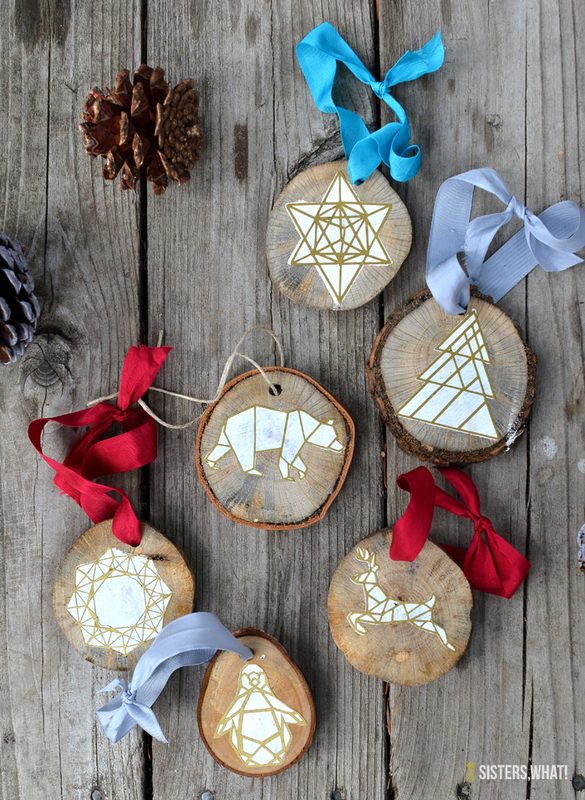 So my geometric ornaments took life. On the back of them, I added words to Christmas songs. Seriously, I love how these turned out. The white and gold make the perfect accent on the green branches of the tree. *sorry, I did take pictures, but I think they got deleted. Measure your wood width and height of your wood slice pieces first. Then change the silhouette files accordingly. Cut your shapes out. Carefully peel the outer layer off your shape. 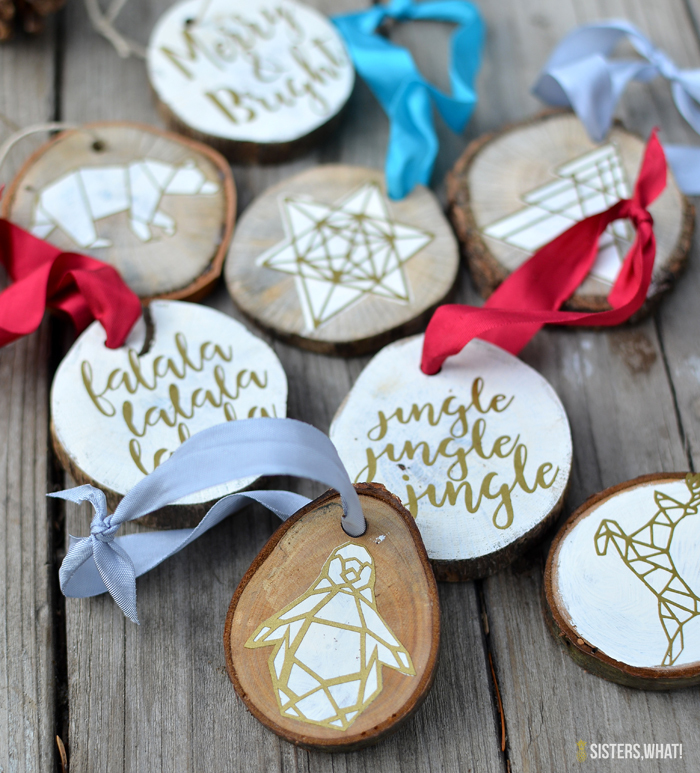 Place it on your ornament and use as a stencil to paint the white background. After the paint has dried, carefully (using transfer tape) place the geometric shape right on top of the white silhouette shape you just painted. Paint the other side of the ornament, completely white and let dry. Then add the lyrics on top. Ok, now time to check out all the other fantastic ornaments in the challenge. Go HERE to vote.